We were thrilled when Laura Baldini, Co-founder of Mother Juice agreed to share an update on the success of her new business endeavor, Mother Juice. What makes this update so cool is not only has she achieved such success and praise in such a short amount of time, but also, learning that delving into a life as a business owner could bring her such personal growth and joy really inspired us. It's so awesome to see someone rise from a difficult time, channel all of their energy into creating something so healthy, not only for herself, but for all of us juice lovers. Thank you Laura for being so open in sharing this experience with us. You are a MsFit that totally rocks! What a year! 2014 has turned out to be my most favorite year of my life. It had a very rough start, if you had asked me 8 months ago if I could have envisioned being where I am in my life now I would have said "no way!" I am truly the happiest I have ever been...ever. My business partner, Ellen Fitzgerald and I hatched the idea to open our first brick and mortar Mother Juice last winter and at that time, it was just a concept. Going through the process and opening our doors, creating our menu and seeing the public reaction to us has been a surreal experience. We do cold pressed organic juices (we have 7 different kinds), smoothies, breakfast bowls (overnight oats & chia seed pudding topped with fruit, sun butter, local jams) and amazing rice and quinoa bowls and salads. 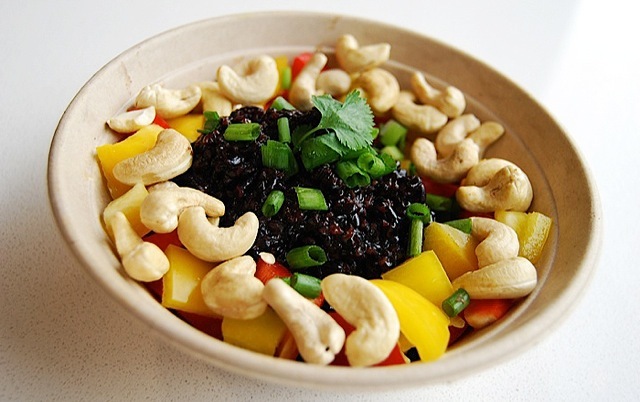 My favorites are The "Forbidden Rice Bow" - we toss black rice in a lime & siracach tamari dressing that we make here, and top with green onions, cashews, cilantro and red and yellow peppers, its soooo good!! I also love our "Raw Pad Thai" - we spiralize carrots and toss them in our house-made almond lime dressing and top with red peppers, sliced almonds and green onions. All gluten and dairy free and 99% vegan, (only our gluten free bread that we use for avocado toast isn't vegan). Really what we are doing at Mother Juice is making things we would make at home, we come up with new stuff almost every week. We both never feel like we are "at work", I think its because we both love our shop so much. We are opening our second shop this spring in Boston and putting our food truck back on the streets too. What's amazing is that neither of us have ever run or opened a restaurant before...we had no clue , just an idea that we executed. MJ's raw pad thai. Carrot noddles tossed in an almond lime dressing. topped with red bell pepper, green onions and almonds. In September 2014, we opened our storefront shop at 625 West Kendall Street in Cambridge. The shop reflects the rustic elements of Mother Juice’s commitment to local and organic farmers, but also the tech-forward personality of its Kendall Square neighborhood. Enjoy our cold-pressed, organic juices, smoothies, and raw vegan snacks at both our indoor seating and outdoor seating in the large courtyard. MsFits, stop by Mother Juice, tell us about your favorite goody there, take a pic and tag #msfitforsociety and #motherjuice! And, if you have an inspirational story you'd love to share, we'd LOVE to hear about it! Send us a note!